Haha. Typo, your gentle patient wit and charm here only becomes finer with every post. No wonder all the world loves Israelis(?). I haven't yet heard the phrase 'Rehut Goof' ('body furniture'), but that would be another suggestion to repair this darling's goof. And she does need to do something, before everyone decides to sit comfortably on her face. I'd say that "RAHUT" is "articulate" rather than "fluent". Beside, even if it was "TAHOR", "TEHORA" or "REHUTA" - as a native Hebrew speaker I'd say they all seem weird for tattoo options. Don't you think? @ Yoni -Why, thank you! You're into a brand new concept here, with the body furniture. We should pitch it to some hot-shot designer. It could be all the rage in Europe. People will stand in lines to get branded with their very own "RIHUT" brand. @ Anonymous - Oops, my bad! Fixed now. @Shmulik - "Articulate", that's the word! I was hunting for it in my head yesterday, but couldn't quite locate it. Still, "Fluent" is pretty close, and does also means RAHUT. Actually, I would say "Eloquent". I recall once apologizing on Ch 2 for my 'moogbellet' (limited) Hebrew and the host charitably calling me 'rahut'. Drove home from Hertzliya wondering whatever could she have meant, besides...um..'lawn-chairs'? I always use 'rahut' for fluent, even though 'shotef' has a nice connection with the 'flow' root of fluency. Plus, 'shotef' kinda also means 'You got 30 days to pay, buddy." How's that for a tattoo on the tokhes? Since it is not Kosher (impure) for a Jew to be tattooed,does it seem ironic to anyone that a purity tattoo on a presumably Jewish women would be mistakenly turned into something else? @Anonymous1: No mistakes here. My word says Tohar, which means "Purity". If you switch the Vav and He, you get Tahor, which means "Pure". @Anonymous2: Were this girl a Jew, it would be ultimately ironic, definitely! However, it's highly unlikely that this girl is Jewish. 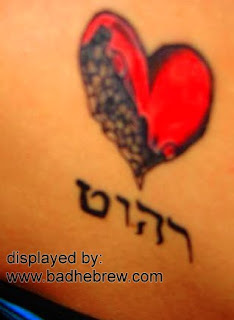 Most of the spiritual and religious Hebrew tattoos are tattooed on Christians. The tattooed Jews usually don't have spiritual intentions, what with the prohibition and all.